I obtained today's sample via a group bottle split, courtesy of My Annoying Opinions. As I mentioned in the two previous reviews, these 1988 Balmenachs have been getting good reviews and word of mouth. 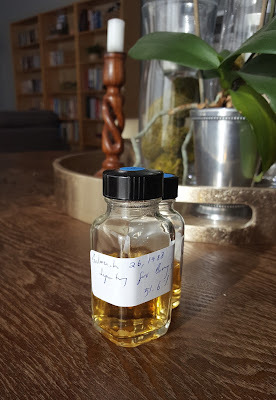 In his review of this cask, MAO references the suspect Magical Vintage theory (see 1998 Laphroaig, 1972 Caperdonich, 1997 Clynelish, etc.). As 1997 is for Clynelish, 1988 is the "vintage" which has the most indie releases for the Balmenach distillery. Does the prevalence of these casks have some psychological influence that leads to the "Magical Vintage" idea? I don't know. Perhaps it's possible that well matured Balmenach is in fact good whisky, no matter what year it was distilled. Hopefully there are more casks sitting warehouses in Scotland that will someday let us know if this is true. On one final note, MAO was not a big fan of this particular Balmenach. I am a big fan of this particular Balmenach. The nose starts with a big ol' barley note, along with papaya and loquats. Some lovely bright oak, sometimes piney, sometimes a little old school musty. A small medicinal note is followed by a smaller metallic one. The pine gets a little bigger with time and is lifted up by a solid fresh ginger note. Toffee, barley, peach and apricot pie (with some cinnamon in the filling) start off the palate. It's plenty sweet, but that's balanced by a moderate bitter note and a spicy zing. Some vanilla shows up later on, along with a rye-like baking spice note. Its nice long finish goes a little tropical, picking up bananas, rum, applesauce, and barley. The medicinal note goes towards band-aids in the nose. Then some dusty barley, citronella candles, and funky fermenting tropical fruit. The palate gets milder. It's peppery, salty, and tangy. Some caramel sauce and dried apricots. The finish is mostly the same as the palate, though less fruity. While the European cask (2819) had a bigger brighter perkier nose, this one's nose was more complex. This cask's palate and finish are the best of the three. The fruit and spice and bitters play very well together and the long exotic finish really hits the spot. It's close to getting itself a 90+ rating, but the whisky doesn't swim particularly well, especially when it comes to the palate where it flattens out. As I mentioned above, MAO had a different take on this whisky. Since our reviews came from the same bottle, take a look at his post in order to calm the great optimism I've now instilled in you.